FORT LEONARD WOOD, Mo. — The hallway leading to the commander’s office is adorned with 40 framed pictures, arranged like a long arrow pointing forward, of the men in uniform who have led this sprawling post in the Ozarks. Bucking the trend, the latest photo added to the wall is of Army Maj. Gen. Donna Martin, the first woman to lead Fort Leonard Wood since it opened in 1941. She's also one of few African-Americans to do so. "I don't consider either of those an obstacle," said Martin, 53. "I would like to think that the Army has chosen me to be in the positions I am in because I am the most qualified." Still, she agreed to share her story because she wants young women to know what’s possible in the military, which has become more inclusive, the St. Louis Post-Dispatch reported. "My wish, my desire is that at some point in our history there won't be a 'first woman' doing anything, it will just be somebody doing something, you know just like 'Maj. Gen. Martin is the commander of Fort Leonard Wood,'" she said. "I don't even really like talking about myself, but it's such a necessity to hear the story of women being successful for our future generations." Of 1.3 million active duty troops, nearly 17 percent of them are women, up from 15 percent in 2001. While that needle hasn’t moved much, the number of women is expected to increase following the December 2015 announcement to lift remaining restrictions on women serving in combat roles. As more women serve in combat, there will likely be more female brass. Almost 800 women are serving in previously closed Army combat jobs. This is how they’re faring. This January will make three years since the Army opened infantry, armor, fire support and special operator jobs to women for the first time. There were recently 71 generals and admirals serving in the active duty military who were women, or 7.5 percent of the total, 939. Martin said the discrepancy hasn't affected policy and procedures. "We've had women in leadership positions for a long time, so I am not aware of any policy that would change because a woman is in charge," she said. That doesn't mean there haven't been hardships. Martin recalled an incident early in her 30-year-career when a male officer told her as a young lieutenant that he wouldn't take orders from a female. "Now my company commander took care of that, and he's subsequently out of the Army," Martin said of the encounter. "But I gotta tell you, I have never heard that in the last 25 years. The culture of the Army is so much more accepting of all people." "The gender integration of the 1970s led to much the same trend line, albeit with plenty of accompanying tension and strife," McManus said. "In that sense, once the armed forces began to tolerate and even promote the idea of female recruitment, it became probable, though not necessarily inevitable, that women would eventually assume leadership roles. In the bigger picture, the following decades led many Americans in and out of the military to understand the obvious truth that such qualities as courage, competence, and fine leadership are not unique to one gender." One of the highest-ranking women in the Army today is Lt. Gen. Gwendolyn Bingham, assistant chief of staff for installation management. "I don't look at my challenges any differently than those that confront both men and women," Bingham said in a prepared statement from the Pentagon. "Attitudes of those you encounter are relevant across a wide spectrum of daily opportunities and obstacles. I will always 'see the glass half full' rather than empty. Daily living is what you make it — it begins with a positive attitude and flows from there." Bingham recently promoted Martin to her second star. Her promotion "comes at an exciting time when the Army continues to enable readiness across the globe while modernizing its capabilities," Bingham said. "No doubt, TEAM Leonard Wood plays a significant role in enabling the readiness of our men and women." Martin was raised in Yorktown, Virginia, just north of Newport News. She was one of six children raised by her single mother, who worked as a nursing assistant, and a network of family in the area. "We are a very close family that kind of raised each other," Martin said. "There was no 'run out and play right away after school.' (It was) 'do your chores and homework.'" Two of her older brothers were in the Army, one was a drill sergeant, the other a recruiter. She initially went to Old Dominion University on a field hockey scholarship. She gave that up and joined Army ROTC, which she said paid for school, pushed her to be physically fit and part of a team and graduate with a degree in criminal justice. After a short stint in the Virginia Army National Guard, she joined the active duty Army as an officer and rose through the ranks of the Military Police Corps. Along the way, she deployed to Iraq and Afghanistan and picked up a master's degree from the Army War College. 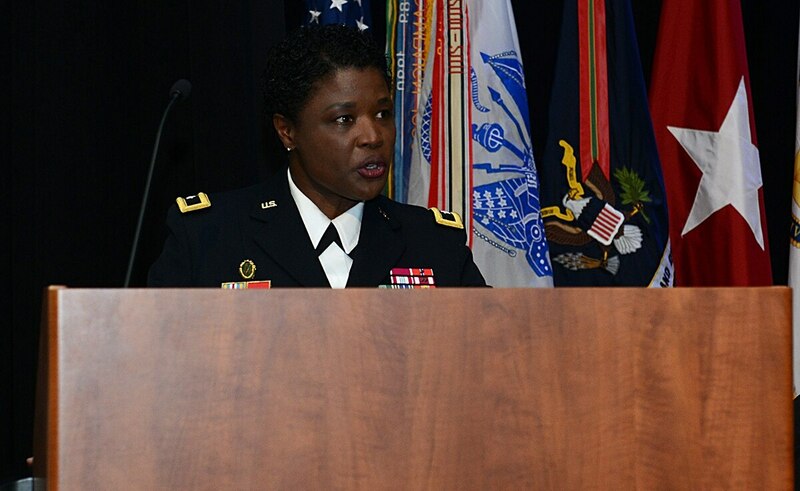 She's been commander of criminal investigations for a brigade based in Germany, chief of investigations for the Army inspector general and a top leader of Army recruiting efforts. She came to Fort Leonard Wood in 2017 to be commandant of the Military Police School. More than a year after all combat jobs were opened to women, problems remain in implementing those changes. Now, as commander of the entire 60,000-acre post, Martin is responsible for one of four locations in the country where Army recruits do basic training. It's also home to three schools: chemical, engineer and military police. In all, more than 80,000 service members pass through each year, including from other countries. While training is the main mission, Martin said a priority over the next two years is to ensure the hospital is modernized. She said $100 million in government funding was previously approved for the project. 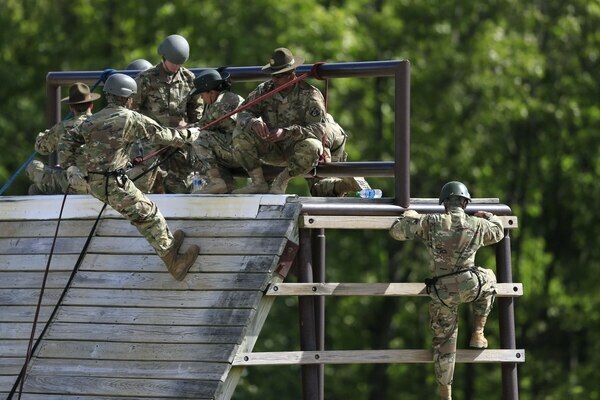 "I want to spearhead and champion and make sure that stays on track to support our military members and their family members here at Fort Leonard Wood," she said. Martin, who is married to a retired Marine officer and has one son in college, said she also wants to make Fort Leonard Wood more accessible by bringing in bigger passenger airplanes. Until that happens, she's outlawed the unofficial name of the post: "Fort Lost in the Woods."